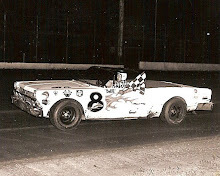 Cedar Rapids, Iowa (July 20, 1966) - The cool afternoon of Friday, July 15, prompted us to climb aboard with Bill McDonough and his pit crew, Ray Hyman of Cedar Rapids and Keith Breese of North Liberty. 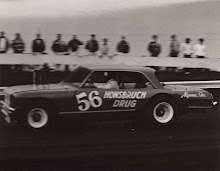 The car was headed down Interstate 80 Davenport way to the Mississippi Valley Fairgrounds, which supports a very good high-banked clay quarter mile track. Arriving at the track we find the pits packed with modified stock cars, their engines screaming as the crews are giving them last minute tunes. 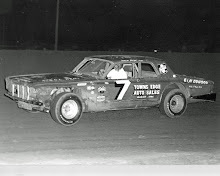 We find McDonough's car, #171, parked next to the Red Droste and Darrell Dake cars. The car, in its gleaming off yellow, is or was a 1966 Chevrolet 2-door Impala, under the hood is stuffed a 427 cubic inch beast of an engine, the racing adaptations of the engine and chassis are business office of #171 is something else. The driver's seat (the only seat) is well placed in the center of the car but almost in the back seat area, which is for weight balance. The controls are specially designed, so the driver has everything within lazy reach. On the floor at the driver's feet are brake and gas pedals. These are used in competition. A full set of pedals are located on the floor on the right side of cockpit, for use in driving in and out of the pits. We thought it would take a piano player to drive it. Looking around the pit area around #171, we found big chests of tools, spare race equipment and stacks of big ten and a half inch wide race tires that cost a bundle...would you believe $62.50 each? We met the car owner, who we have seen around race tracks for a long time, Dwayne Schneider of Iowa City. The car owner operates a successful radiator repair business and for 10 years has owned stock cars, has a wonderful sense of humor, which is the first owner or they cry a lot. 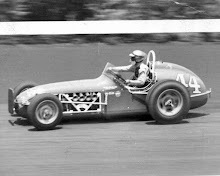 Dwayne formerly had Cal Swanson of Cedar Falls behind the wheel of his race cars for years. Watching Schneider double check his car in the pits explained why he has been successful with race cars. The races start at 8:00 p.m. with the novice cars first on the program. The novice races are wild and slam bang. In the first heat of the modified, #171 was running very strong with McDonough able to pull away from the field at will on the straight-aways, but the turns were like glass and he had to be happy with a second place. The other heats, semi-main, were wild and with one of the cars taking two other cars over the bank on turn one, then crashing into electricians pick up truck, putting all involved out of the race including the electrician’s truck. The hard running McDonough fought and dodged the slippery turns and spinning cars, including a complete 360 spin by himself, and was able to finish third in the feature, a good night's work despite the conditions. With #171 loaded on the truck, tools and equipment stowed aboard, we sat around rerunning many races, while the drivers waited for the pay window to open. 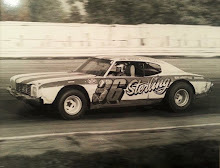 We talked with McDonough and many of his driver friends and learned that Bill has been driving 14 years in sports cars, three quarter midgets, and modified stocks, mostly on the Midwest tracks with many races on the southern Minnesota tracks. We wanted to meet Bill's wife, but when asked where she was, the husky lead foot answered, “home helping Tim build his soap box derby car for Sunday's races." Bill, we found, is an excellent public speaker on the subject of racing, ala the late Eddie Sachs, and spoke to 17 local groups last winter. We found the throttle jammer raises Great Danes, has eight all as big as Polo Ponies.